1. Stanishevska, T. and Manamperi, N. (2018). ﻿"Refugee Crisis and its effect on crime trends in Germany"﻿, The Empirical Economic Letters, vol. 17, issue 8. 2. Manamperi, N. (2016). ﻿"Does Military Expenditure Hinder Economic Growth: Evidence from Greece and Turkey"﻿, Journal of Policy Modeling, vol. 38, issue 6, pages 1171 - 1193. 3. Manamperi, N. (2016). "The Dynamics between Government Debt and Economic Growth in South Asia : A Time Series Approach", The Empirical Economic Letters, Vol. 15, issue 9. 4. Manamperi, N. (2015). 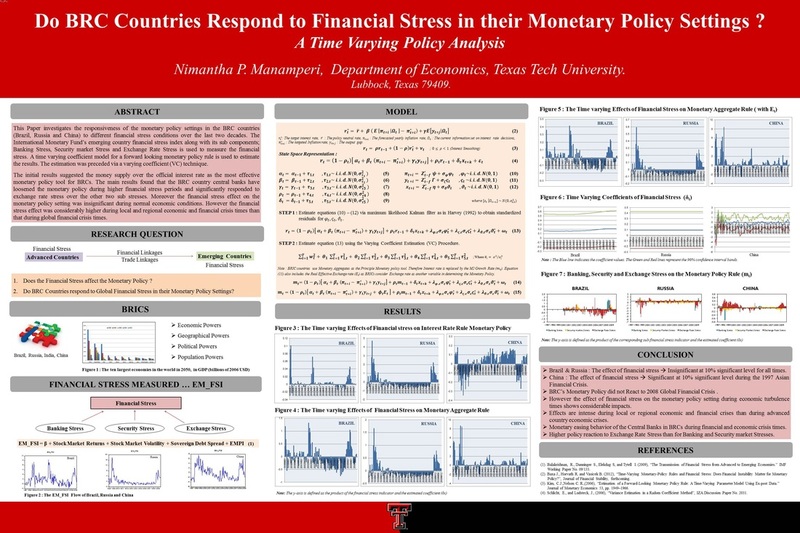 "A Comparative Analysis on US Financial Stress Indicators", Journal of Economics and Financial Issues, Volume:5 (2), Page 613 - 623. 5. Manamperi, N. (2014). " The Short and Long Run Dynamics between Inflation and Economic Growth in BRICS", Applied Economic Letters, Volume:21 (2), Page 140 - 145. "Do BRIC Countries respond to Financial Stress in their Monetary Policy Settings - A Time Varying Policy Analysis"
"The Dynamics between Government Debt and Economic Growth in South Asia : A Time Series Approach"
" A Living Standard Based Grouping System for Divisional Secretary's divisions in Western Province in Sri Lanka - A Factor Analysis"
"The effects of individual Fiscal policy changes in European Member Countries on the European Bank Monetary Policy Settings"
" Mobile Usage effect on Economic Growth"
" Effect of Military Expenditure on Economic Growth in BRICS"
"How does the Advanced Country Fiscal Policy react to Banking, Stock and Exchange Market Stresses? - A VAR Analysis"
"A Time varying Monetary Policy Analysis for Sri Lanka - Evidence from three Decades"
"Does Sri Lanka responds to Exchange market stress in its Monetary Policy - A Time Varying Policy Analysis"